For handling of cardboard boxes, wood panels, marble and granite slabs, glass panes as well as plastic bags, abrasive springs and more: the suction cups, available from Vuototecnica in various conformations, are able to meet the most varied needs. 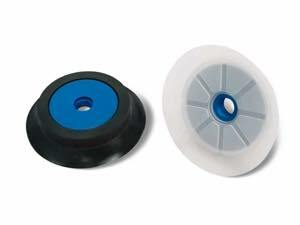 • Cupped suction cup: the most common, used for moving very light objects even with rough or irregular surfaces such as plastic boxes, thin metal or glass slabs or wood panels. • Bellows suction cup: recommended in all cases where it is necessary to move sheets of paper or cardboard, thin sheets of metal, etc. Thanks to their great flexibility they are also used to pick up sloped surfaces or to compensate planarity errors. • Flat suction cups, round and rectangular: for vertical or horizontal movement of large loads such as marble or granite slabs. • Suction cups in foam rubber: for picking up course or very rough surfaces such as rough cement, cut marble, anti-skid sheet metal, etc. • MaxiGrip Suction cups: recommended in the Automotive sector for handling of oily sheet metal or body parts. • Circular crown suction cups: capable of picking up loads with a central hole such as CDs, bored discs, gears or similar objects. 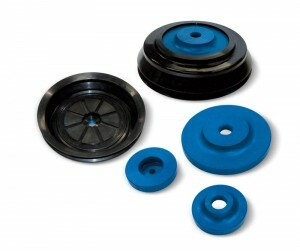 • Elliptical plane suction cups: used to move plastic objects, boxes, with limited surface area. 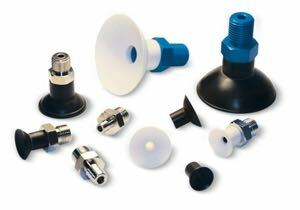 • Particular suction cups: various conformations, can resolve all of the countless problems of pick up and handling. Suitable for picking up CD’s, handling of envelopes, labels, biscuits and chocolates, figurines, tiles, nots and bolts, etc. • Discover other details about the Vuototecnica suction cups. 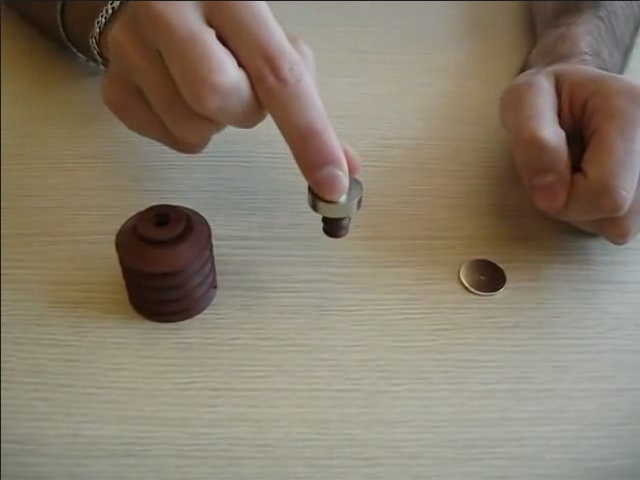 Today we present you this video in which you can see in action a machine for biscuits. As you can see, the complexity of the machines is made simple by the fluidity and perfect score of the operations. In this process Vuototecnica helps, with its silicone suction cups, made with FDA certified compound, for the food industry. Please, note the firm and delicate grip – due to the friable nature of the product – the concertation of all the phases. Focus mainly on the taking and release phases, which occur, as you can see, without jolts and in a precise way. 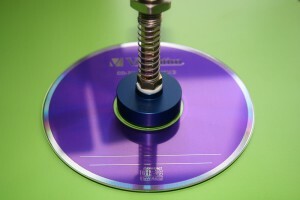 All Vuototecnica suction cups are also marked with a code and/or the logo. This is a very important aspect: there are often products without logo or code with an alleged non-toxic compound certificate. It seems obvious, however, that it is impossible to certify a suction cup that has no identification. Vuototecnica works every day to design gripping solutions that are flexible and facilitate customers, whatever their business sector. 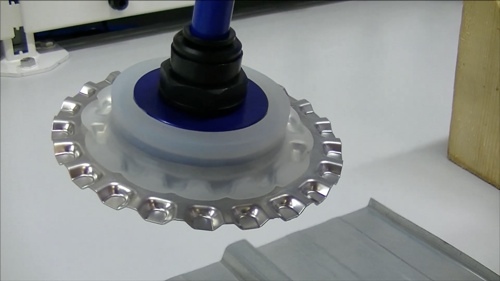 In the following video you will find some examples of this flexibility in the use of flat and bellows elliptical suction cups (in the catalogue). These suction cups are generally used for gripping and handling cardboard boxes, wooden boards, ceramic tiles, iron or stainless steel sheets, and whatever have long and narrow grip surfaces. In the video you can see them performing on different types of material, from plexiglass, to brick, from steel to glass, from plastic to tin. All this happens with the maximum stability of grip, as you can see, thanks to a labyrinth structure, inside the suction cups, able to adapt also perforated or knurled, uneven and rough surfaces, as that of the tile, or slightly rounded surfaces: it is the case of the small green tube and of the tin can. 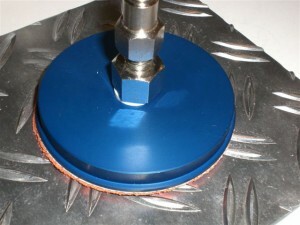 The bellow design of the elliptical suction cup also allows the compensation of heights during the job, even in the case in which we work with packages of bulk and liquid products, which are easily malleable, or when the surface of the object is not perfectly perpendicular to the axis of the suction cup. In addition, Vuototecnica suction cups allow greater ease and rate of release. They are usually available in three standard compounds, but, on request, we can provide them in special compounds and with the most suitable accessories. You can see new 01 30 45 S bellow suction cups in action in the video below. 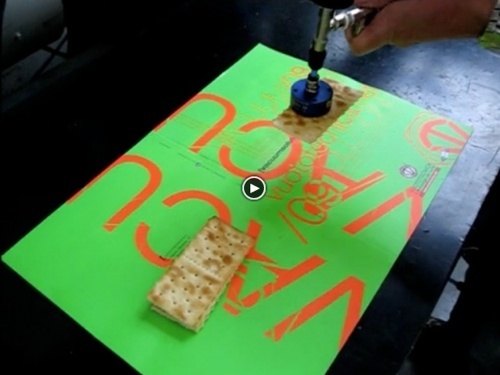 A Vuototecnica customer – a well-known italian manufacturer of crackers – successfully used them. The robot, equipped with these Vuototecnica suction cups, deals with pick and place of flowpacks. The end user encountered an improvement in the operation with these new suction cups immediately, compared to those used previously. The gripping lip, in fact, is designed to be extremely flexible and fit also to the upside of plastic material packaging. And this feature brought another benefit to the customer, in terms of energy saving. The grip of these suction cups takes place, in fact, with a lower volumetric suction flow rate. The support of this suction cup, in anodized aluminum, is threaded male or female, 1/4″ gas for fixing, and ensure the proper flow to the suction cup. Taking fabrics, felts or paddings. Bernoulli! We propose today, from Vuototecnica catalogue, Bernoulli suction cups (BEC). 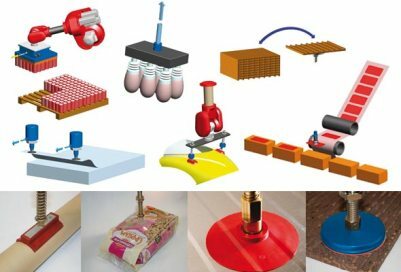 They are suitable for taking particularly delicate or friable products (bakery products, cardboard interlayers, thin sheets etc …) or for which, in general, the contact with the suction cups or grippers would be problematic as they are highly deformable, porous or irregular. BEC are fed with compressed air and are also defined as suction cups without contact as there is always a flow of lamellar air between the taken object and the plane of the suction cup in aluminum. The suction cups use Bernoulli’s theorem, the same for which it is possible to interpret the effect of lift of the wings of an aircraft. They can be, for example, the ideal solution in the textile industry for the taking of fabrics, felts or paddings to be handled with care to avoid wasting materials; as it happens instead when they are manipulated with needle grippers. They are particularly effective in leafing several overlapping fabrics. Bernoulli suction cups by Vuototecnica are equipped with pins- stabilizers to prevent rotation of the object and they are operative from a minimum pressure of 1 bar. For the gripping of products with irregular surfaces, Vuototecnica offers its special foam rubber suction cups. In this video you can see an application of these suction cups on food, such as corncobs, which have a grained surface, difficult to grip. 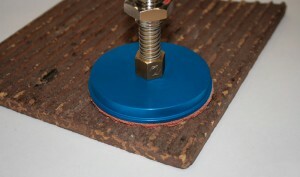 The foam rubber of these suction cups in fact has a density that offers excellent grip even on rough or irregularly shaped products like sawn, flamed or bush hammered marbles; non-slip or corrugated textured sheets, cement raw products, outdoor tiles. It is possible to use them within the temperature range from -40 ° C to +80 ° C for OF orange foam rubber, from -20 ° C to +80 ° C for NF neoprene foam rubber; they maintain their elasticity even after many work cycles. Thanks to their self-adhesive side, the suction cups attach themselves quickly to anodized aluminum holders, provided with a central threaded hole for mounting on the automatic mechanism. Bigger holders with two threaded holes, equidistant from the center, are also available, for the possible insertion of anti rotation guide pins. To learn more, please contact the Vuototecnica staff. The handling of large metal sheets and heavy loads is a slow and difficult process, in several stages, in shipbuilding. It involves the use of clamps, slings, hooks and other tools. The probability that the load falls is high, with dangerous repercussions on the building site in terms of safety and cost. The procedure for hooking and slinging is not simple. The building material (sheets, profiles and pipes) comes, generally, on the construction site from trucks for heavy loads. The first movement is performed, with the unloading and the storage of the pieces. During the movement, metal sheets are positioned horizontally within big warehouses. 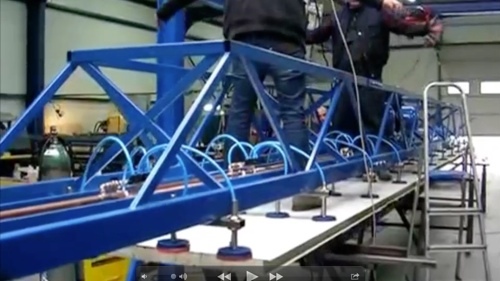 Then they have to be moved again, also vertically, during the assembly of the hull and superstructures. A lengthy and elaborate process. This no longer happens, since Vuototecnica designed its round flat suction cups, code 08 360 10, specially designed for handling heavy loads vertically and horizontally, with a lifting force of 254.3 kg (calculated with a safety factor that is equal to 3). 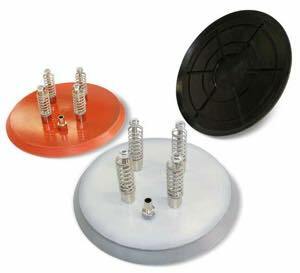 These suction cups have a labyrinth-graved tabletop, to facilitate and ensure the grip. They are available in three different standard compounds, fitting to materials and they are already equipped with four sprung cup holders, for they can be assembled on the automatism safely. They are vulcanized on a steel support, on which four pins are cemented - they are in steel, too - with four self-locking nuts. The vacuum connection is ensured by a ½" gas threaded sleeve, which ensures the proper suction flow. Vuototecnica conceived 08 30 45 S bellow suction cups for the handling of plastic films and flow packs. Watch their efficiency in this video; they have an excellent seal even on the rear junction flap of pasta packs. They ensure the handling of packs of different shape, size and weight, without damaging the content. The suction cup holder, in anodized aluminum, - 1/4" gas either male or female threaded, for fixing on the automatism - ensure the proper suction flow to the suction cup. 08 30 45 S suction cups adapt themselves, thanks to their grip lip which is thin and soft, and thanks to the film surface ripples during the intake. A revolutionary solution in studying gripping hands for this type of products and packaging. Christmas is coming and the sweetest symbol of this celebration, as well as Pandoro and Panettone, are biscuits, with a thousand shapes and consistencies. They are on everyone table; sweet manufacturers are working at full capacity for this to happen. Even Vuototecnica is part of the production process of these delights. 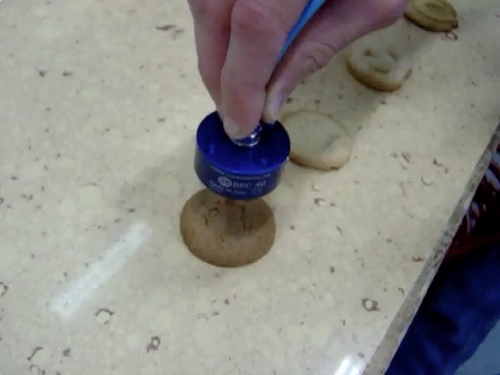 In this video, you can see in action Bernoulli (BEC) suction cups on famous butter biscuits located in round aluminum boxes, so beloved during tea time. As you can see, biscuits have irregular shapes, some of them have little holes that would be an obstacle, in other conditions. Not with Bernoulli suction cups. 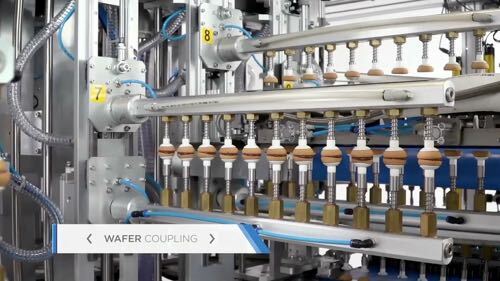 Suited to take every baked product, they generate a flow of lamellar air that arises between them and the biscuit. There is no contact in the grip and in this way you can also avoid the aspiration of crumbs, sugar, and various garnishes, while in traditional systems with rubber suction cups, you are obliged to clean the vacuum circuit every week because of the aspiration of dust and leftovers. The interesting thing is that BEC suction cups, despite they do not involve direct contact with the product to handle, are equipped with stabilizers pins so that the biscuit does not rotate. The stabilizers are made of silicone rubber for food, totally suitable to correctly position picked up products. 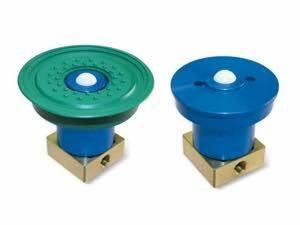 Vuototecnica Bernoulli suction cups operate from a supply minimum pressure of 1 bar. Gripping marble, glass, cement and ceramics products – which have an extra smooth and slippery surface, or on the contrary have very rough and irregular finishes – is always a problem. 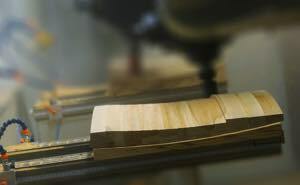 Manufacturing companies producing these materials are distressed, because these are often very expensive pieces and any loss of load means large unexpected expenses. Vuototecnica designed for all these cases a very flexible round flat suction cup (item code 08 80 20), able to adapt to all these surfaces. It has a very thin, soft and sensitive lip; and with its bearing surface, with unique reliefs, allows a considerable grip with the load. 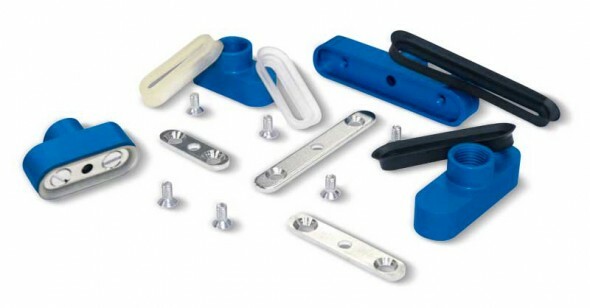 In addition, it has the advantage of interchangeability: it can be fitted without adhesives on the support in anodized aluminum, which is itself easily attachable to the machine thanks to a central threaded hole. It goes without saying that the replacement of this suction cup is very simple. You can change the rubber compound according to the materials of the objects to manipulate and depending on the environment. For the realization of vacuum work surfaces, in particular for CNC machines for woodworking, Vuototecnica designed these built-in suction cups with a ball valve able to create vacuum and retain panels to be processed only when these are resting on suction cups. Only if the panel load activates the valve sealing ball, suction is activated, to avoid unnecessary vacuum losses when there is no piece to be clamped. In addition, these special suction cups, designed specifically for the woodworking industry, have a sturdy cylindrical support in anodized aluminum and a squared closure block in brass, which prevents the suction cup rotation and also acts as an vacuum distribution manifold. On request, we can produce them in other materials. To see the designs and choose the suction cups, in different compounds, you can refer to the online catalogue, or, please, request a hard copy to the company or download apps for iPad and iPhone, to always have with you the best solutions for each project. 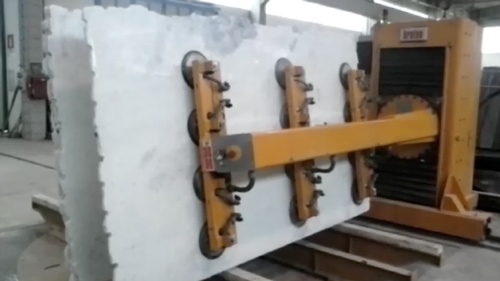 In the handling of marble and sawn granite slabs, you must pay particular attention to materials quality and characteristics. 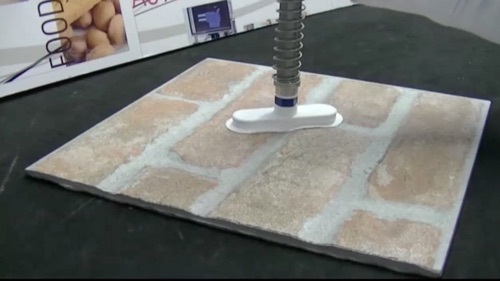 In this video you can see in action the Vuototecnica round plane suction cups with vulcanized support (08 … 40 series), employed for more than 25 years with satisfaction by leading companies in the field of marble. These suction cups are designed for lifting and moving heavy loads, both horizontally and vertically. Suction cup double lip adapts to sawn and irregular surfaces in an exemplary manner, such as the ones you see in the video, ensuring a perfect grip. These vacuum cups have a labyrinth graved table top, too, made in he same compound, which also allows the management of thin and fragile slabs, without bending materials when gripping them. They can also be used in other fields with equal success, such as, for example, for the grip of embossed or corrugated sheets, rough wooden planks, concrete prefabricated. 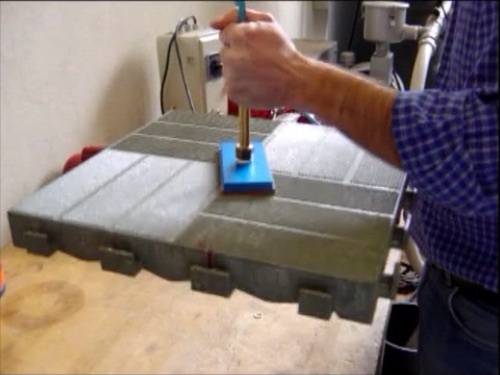 In this video you can see Vuototecnica flat round Geranium foam rubber suction cups in action on insulated sandwich panels. You will certainly be impressed by their grip: they are able to support the weight of two workers standing on the panels. The secret of a such grip is in the special foam rubber compound, called Geranium, abbreviation OF, which has a density such as to permit the gripping also on very uneven and rough surfaces. The advantage is that these suction cups retain their own elasticity even after many work cycles. In addition to insulating panels handling, they are ideal for vacuum gripping on very rough surfaces, such as rough concrete, sawn marbles, textured or non-slip and corrugated sheets, striatum plexiglas and many other materials. When the load to be handled has oiled and irregular surfaces, it is necessary to employ neoprene foam rubber suction cups, abbreviation NF, able to withstand the corrosive action of oils. 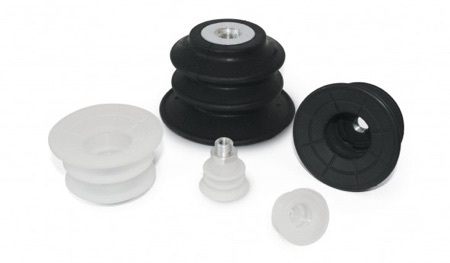 To allow rapid fixing at their supports, all foam rubber suction cups are equipped with a self-adhesive side. To replace them, it will be enough to require only adhesive foam rubber suction cup in your favorite compound, changing nothing. These suction cups can withstand minimum temperatures of -40°C (-20°C for NF neoprene foam rubber) and up to +80 °C. Professional Centering and Clamping, for glass panels which feature on digital command machines: the solution, Vuototecnica! In the glasswork industry and in all contexts where panels made of this fragile material have to be clamped, as is the case in the CNC machining sector, there are many factors to bear in mind. Vuototecnica, with its expansive experience working in collaboration with sector industries, designs and manufactures supports with hidden check pivot to enable rapid centering of the load to be clamped and the suction caps to the work surface. These anodized aluminium supports are equipped, as standard, with a quick coupling for vacuum connection, therefore, when the vacuum is activated, the plastic check pivot re-enters its housing and it remains there until it is released once again thanks to a stainless steel spring. 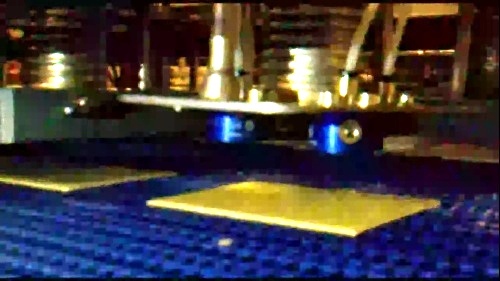 It is possible to see these devices in use in the video, where they are applied to some suction caps with ball valve and self-locking support. 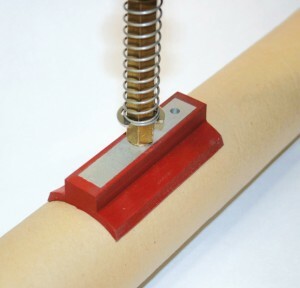 The suction caps in question are genuine clamping systems, ideal for vacuum handling of glass or smooth marble, as they are equipped with a special non-slip plastic coating which makes the tangential gripping of the glass, even more secure. The features ensure a vacuum is only created where the load to be handled activates the ball grip shutter and they are made of a strong aluminium support with a large base surface area, with edge seal. The aforementioned enables safe fastening to the work surface. 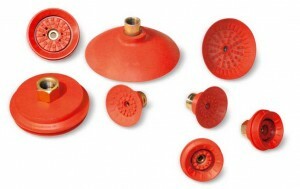 These suction caps are available in different shapes and may be modified based upon client requirements. 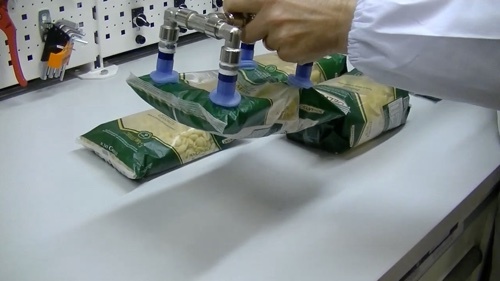 Vuototecnica proposes solutions to solve many problems of manipulation in the packaging field. The support of the suction cup can be made of nickel-plated brass or anodized aluminum and is provided with a central pin, threaded, male or female, to allow the suction and the fastening on the automated equipment. But what makes 08 30 24S truly unique is the gripping lip: very thin, soft and flexible, which easily adapts to the ripples of plastic films. Furthermore, the suction cup is provided with an internal labyrinth of abutment which prevents the obstruction by the plastic film, of the central suction hole; to avoid the reduction of the force/diameter of the cup. Vacuum technology is a crucial element of the forming machines used to create cardboard packaging elements for the packaging industry. Vuototecnica designs and manufactures flat elliptical vacuum cups, as well as the relative supports, to be lodged within the working surfaces of these forming machines. 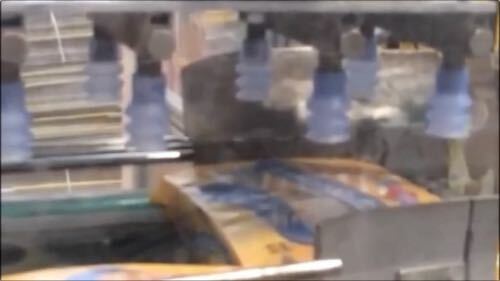 These units are capable of holding one of the cardboard’s sides stationary while the forming takes place on the opposite side using traditional vacuum cups. These vacuum cups can nevertheless also be used for manipulating and handling small objects made of plastic or cardboard. Thanks to their reduced internal volumes, these vacuum cups offer exceptional gripping stability and, more importantly, provide for simple and cost-effective maintenance. Once consumed, in fact, it is sufficient to replace the lips of the vacuum cups themselves, which are available in various compounds based on the gripping surface, the working environment and the required operating cycles. With Vuototecnica’s elliptical vacuum cups, you’ll never have to replace an entire vacuum cup and vulcanized metal support again, thus ensuring optimal savings in terms of both time and money. As everyone knows, handling eggs requires maximum caution. But on an industrial level, extremely fast handling times are necessary to maximize productivity. In order to resolve the problems faced by producers, Vuototecnica has developed three special bellows vacuum cups for gripping eggs: the 08 33 50 S, the 08 40 80 S and the 08 42 90 N.
Once suction contact is made with the surface of the egg, these vacuum cups withdraw to create an extremely fast, yet gentle lifting movement. 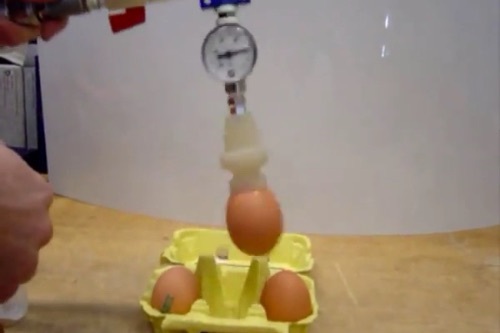 Vuototecnica also offers a wide range of components for generating and regulating vacuum levels, which, in the specific case of eggs, must be limited in order to avoid damaging the shells due to any excessive force exerted by the vacuum cup. 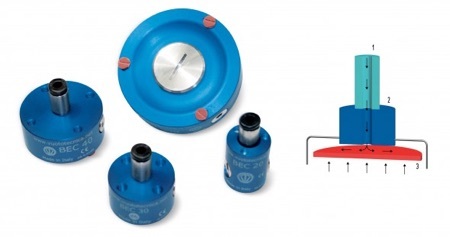 To this end,Vuototecnica’s vacuum regulators guarantee the proper adjustment and maintenance of low vacuum levels inside the vacuum cups without cutting off the suction flow from the vacuum source itself. Furthermore, Vuototecnica offers its customers the choice in two different types of vacuum generating tools: single stage or multi-stage pneumatic ejectors (which allow for the vacuum levels to be adjusted by simply regulating the supply pressure) or electric rotary vane vacuum pumps equipped with vacuum reducers. These vacuum sources represent viable alternatives to the more traditional vacuum pumps with side channels that are often found installed upon egg handling systems, and offer significant advantages for the manufacturer and the end user alike in terms of noise reduction, maintenance and energy savings. Vuototecnica’s skilled engineers are always available to help customers select the solutions that are best suited to their needs. The vacuum cups for eggs are made of an FDA certifiable silicone compound. Vuototecnica is also at the customer’s complete disposal for any vacuum cup customization requirements they may have, based on the characteristics of the products to be handled and the specific production environments. When the vacuum source is missing: Vuototecnica self-locking vacuum cups! 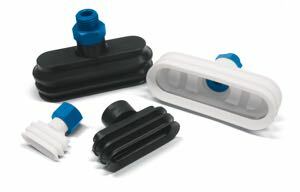 Whenever it is not possible, useful or convenient to create a vacuum using an external vacuum source, like a vacuum pump or vacuum generator, or wherever the items to be handled are being shifted along an assembly line’s belt conveyor, Vuototecnica’s pull-release clamping vacuum cups represent the ideal solution for retaining easy-to-grip components with smooth impermeable surfaces, like glass panes or sheet metal. Some applications include the handling of windshields on the automobile industry’s assembly lines, the handling of stainless steel objects like pots and kitchen accessories during ther various stages of production (painting, drying, etc. ), the handling of marble products for construction use and the handling of glass panes by robotic systems. These applications do not require the use of external vacuum sources since the objects themselves create the vacuum when pressed against the vacuum cups, while the integrated check valve ensures that the grip is maintained. In order to release the product, the vacuum cup just has to be slightly raised and the check valve will open in order to restore the atmospheric pressure. Vuototecnica’s pull-release clamping vacuum cups are made from nickel-plated brass with steel guide bushes, and are even available in a non-rotating version. Vuototecnica is even capable of customizing its products to meet the customer’s specific requirements. A convertible car driving along a deserted road at sunset, the sea alongside and accompanied by dreamlike music. We are in a film and the landscape slides past the window. What we see on the screen was specially prepared for us by a team of technical image experts. The cameras for shooting of the car in motion require appropriate media to allow for a smoother shot without jerky movements and, above all, ensuring stability, given the high costs of the cameras. 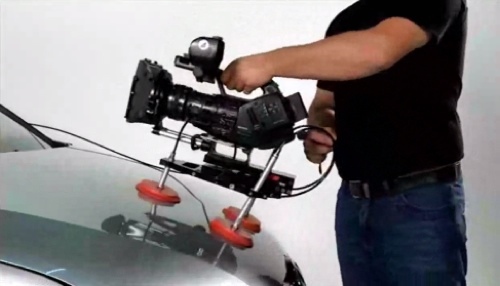 A German company has recently installed Vuototecnica Maxigrip Cups on the cars for perfect shooting of the cinematic scenes, a guarantee of perfect anchoring and stability. With a very high friction coefficient, available in all shapes and sizes, the Maxigrip cups offer extreme flexibility of the grip lip, which allows them to adapt to flat, concave and convex surfaces, also on greasy or wet sheeting. As such, perfect to apply to the bodywork of a car. They are available in all compounds and are stain-resistant and thus will not ruin the surface of the filming car. Finally the range of accessories (reductions, grafts, adapters and positionable knuckle joints) allow even greater stability in attachment of the film camera. Thus also the movement and speed of the car are not problematic. The use of suction cups in the food industry is becoming increasingly more common but the handling of products requires strict regulations and high quality standards. Caution must be used when picking up food products to prevent contaminating the products and to ensure maximum cleanliness. 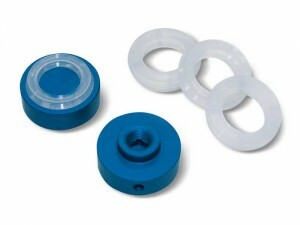 For this reason, Vuototecnica offers magnetic silicone compound suction cups created especially for the food industry. The compound of suction cups can be easily detected in case of breakage or accidental detachment thanks to the metal detectors used to protect food products, which detect the ferrite powder contained in them. In addition, the material has a high resistance to solvents, UV rays, oxygen, ozone and to chlorates, withstanding any type of production environment. The suction cups can be used at temperatures ranging from -50° to 275° C and for all types of food products. “Maximum care” is the watchword when it comes to handling fragile or deformable food products. 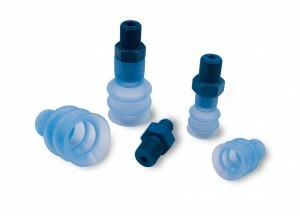 To prevent fragile or lightweight products from breaking, Vuototecnica has BEC suction cups for non-contact handling. The cups are based on the Bernoulli theorem, and allow products to be lifted without the need for contact like the puff pastry, a food that is quite delicate and easily deformed when handled. The BEC also have spacers made of silicone and antistatic rubber for foods that keep the gripped object from moving side to side. Compact discs are optical discs designed to store data in digital format. They’re made of transparent polycarbonate, covered with a thin metallic layer upon which the data is “recorded” using lasers. The reading operations are also performed using lasers, but the devices must be treated with maximum care in order to ensure their constant and precise functionality. This includes the production stage, before they are placed on the market. In the field of industrial automation, it’s extremely important to be able to develop ad hoc solutions for every product. Vuototecnica is capable of providing various types of suction cups based on the specific requirements of the objects to be handled, such as ring suction cups, which are designed to hold objects with a central hole, like CDs. These suction cups are often used in the electronics industry; they have an extremely thin sealing lip in order to allow them to adapt well to rough surfaces, such as abrasive disks for angle grinders. 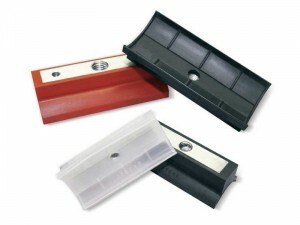 They are cold fitted to the supports and are made from silicone S for handling compact discs. The supports are made from anodized aluminium and are equipped with a threaded central hole, which provides for the suctioning operations and allows the unit to be fastened to the automated mechanism itself. Ring suction cups can be used to handle perforated disks of any material, including gears, pulleys and even abrasive discs. 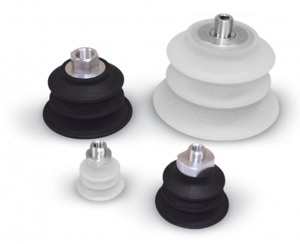 In order to meet its customers’ requirements, Vuototecnica even produces these suction cups in different blends. Download the Vuototecnica Catalogue in PDF format or request a printed copy to find out more about all the solutions we have to offer! Glass is a material that’s made up of raw materials that are readily available upon the earth. 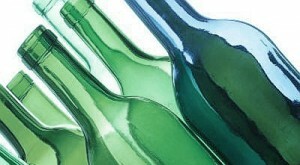 What’s more, it can be continuously recycled and therefore has an extremely low environmental impact. In the production of glass bottles or cylindrical glass objects, the raw materials are melted in furnaces and cut by shearing machines before being moulded into their classic cylindrical shapes. After being annealed in the furnaces and inspected, the bottles must be handled for packaging. It is precisely at this stage that the need arises for suction cups capable of adapting to the cylindrical shapes and smooth surfaces of the bottles themselves. 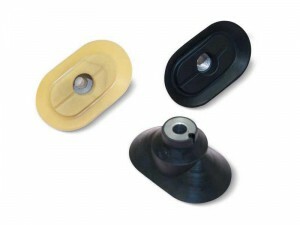 Based on the types of objects to be handled, the suction cups can be manufactured in nitrile or oil-resistant rubber A, which are suitable for gripping glass materials and loads with smooth surfaces and are highly resistant to oil, heat and aging; in natural rubber N, for irregular or rough surfaces (wood, cardboard, marble, brick, glass or plastic); in silicone S, even produced according to the most well-known food-grade manufacturing standards. In addition to bottles, these suction cups can even be used in conjunction with a wide range of other cylindrical objects, including pipes and round profiles. The support is made of aluminium and has a threaded central hole to facilitate machine mounting, as well as a lateral hole to facilitate the insertion of an anti-rotation guide pin. Vuototecnica provides custom solutions to meet the needs of every industrial sector. Rough, uneven and sometimes even grooved surfaces can be extremely difficult to handle and manipulate. 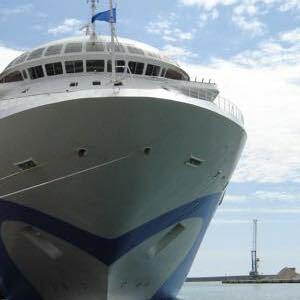 There is a constant risk of accidental damage to the materials themselves due to suction cups failing to properly adhere to the surface, thus resulting in wasted time and money. Vuototecnica has permanently eliminated this risk thanks to its innovative foam rubber suction cups, which are available in flat round or flat rectangular versions. They are particularly suitable for use on rough surfaces, like sawn marble, textured sheet metal, corrugated or anti-slip materials, striped acrylic, raw concrete, textured patio and garden tiles and, more generally, in all cases where a tight grip on a rough surface is required. In fact, the foam’s softness allows it to adapt to all the grooves and to perfectly adhere to the material. 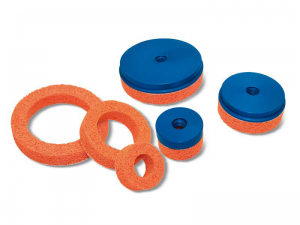 Our foam rubber suction cups are made using a special high density blend of material, with an optimal elastic yield. They have a self-adhesive side for quick and easy fastening and offer guaranteed functionality at temperatures ranging from -40°C to +80°C. In the case of oil-coated grip surfaces and outdoor equipment, it is possible to make use of neoprene foam (NF) rubber, which has an operating temperature range of -20°C to +80°C and is capable of withstanding the wear and tear of the atmospheric agents. The durability of these suction cups is guaranteed over time, even after many operating cycles. Oils, grease and fuels: problem solved with Vuototecnica BENZ compound suction cups! 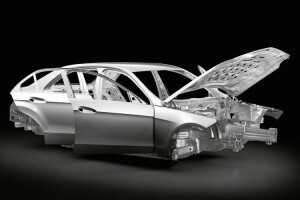 In the automotive industry there is often the need to manipulate stamped or deep drawn metal sheets which then go on to make up the bodywork or other car components. 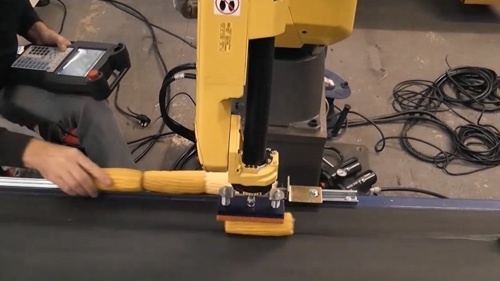 Today's automatic industry allows performing all phases of car production with robots, but these don't always represent the most ideal solutions for the gripping metal plates and glass that are in contact with oils, grease and fuels. The result is imprecision in work and poor safety in the workplace. Vuototecnica solves these problems by manufacturing different types of suction cups for the automotive sector: flat, bellows, elliptical and maxigrip of different shapes and sizes. The suction cups are made of BENZ compound, resistant to chlorine which is usually present in the oils for stamping and deep drawing sheet metal, and they carry out their work flawlessly, regardless of the weight and cleanliness of the load. The maxigrip suction cups provide an unparalleled grip, even on very oily and wet surfaces; as a matter of fact, the liquids are easily drained, without any worries. The grip lip is extremely sensitive and this makes manipulation easy, whatever the shape of the object to be gripped, whether it be concave, flat or convex. If you are thinking that a strong grip may be broken, warped or leave unwanted marks on the surfaces, think again, because despite the high friction coefficient, Vuototecnica suction cups are designed with extreme attention to materials and the application processes. In addition, a wide range of supports and accessories are available which can be installed on any type of robot. Discover our solutions for the automotive sector. The glass industry encompasses a variety of processes and designs. The fragility of products and the necessary perfection of each piece often make handling difficult. Vuototecnica offers various solutions in this field, even for special manipulation requirements such as gripping glass sheets stored vertically. 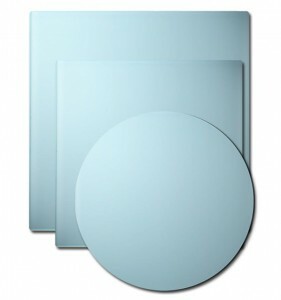 Bellow suction cups for glass, are ideal for this application since once the suction cup is placed on the surface and vacuum is attained, they have the ability to quickly retract, thereby facilitating the separation of superimposed glass plates. The sheet is gripped and separated from any adjacent to it, without the risk of breaking or falling it. It is first positioned perpendicular to the floor and after this phase it can be moved in all directions without any adhesion problems and in total safety. The bellow suction cups for glass are available in different compounds depending on the requirements: they don't leave halos or marks on the glass, they increase adherence in case of uneven or wet surfaces and they work in contact with atmospheric agents, in addition to having many other qualities. Find the solution to your problem. Challenge us! Crackers are light and flaky baked goods. The fact is, however, that they are so thin and fragile that one must be extremely careful in order to avoid breaking them. In order to prevent such inconveniences with crackers and other light and flaky food products, their producers rely upon special handling techniques. 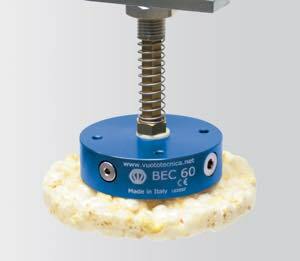 Vuototecnica offers BEC vacuum cups for non-contact gripping. Though designed for semiconductor plates, silicon disks, solar cells and foils and films made from precious metals, these units also have a wide range of potential applications in the food industry. The vacuum cups are based on Bernoulli’s principle, the same theory that explains how an airplane’s wing produces lift. 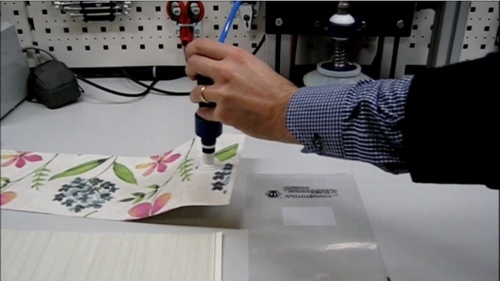 In fact, the “lift” effect that they generate even allows for light products to be lifted, with no need for contact to be made, and is used for a wide range of lifting and separating applications: including sheets of paper, cardboard and stacked laminations. The BEC are equipped with anti-static food-grade silicone rubber spacers in order prevent any lateral movements of the gripped object. These special vacuum cups can also used for handling crumbly baked goods that produce light powders, such as crackers, thus preventing machine clogging and consequent production downtime. Flawless handling, with no contact! 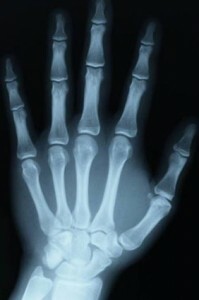 X-rays play a very important role in hospitals: they show the portion of the body being examined in clear detail. X-rays are very similar to the film used in photography, consisting of plastic coated material with a thin layer of silver nitrate able to expose X-rays. These supports are highly electrostatically charged, so in the development of X-rays, users must be very careful handling them to avoid contaminants that could affect the validity of the examination. For this application, Vuototecnica has created special mixture suction cups that do not leave any traces on the X-rays, for X-ray film developing machines. The mix of elliptical suction cups with vulcanised support by Vuototecnica does not carry electrostatic charges and is therefore ideal for this kind of work. The original conformation of the suction cups allows users move and withdraw one X-ray at a time without leaving halos and without deforming the film. The aluminium supports are vulcanised on the suction cups and have a side groove that prevents rotation. The elliptical suction cups with vulcanised support by Vuototecnica are useful in any situation which requires safe handling of X-rays, laminates, sheets, pages and other kinds of products for which the separation of many thin superimposed layers is necessary. All this without ever forgetting the Vuototecnica keywords: quality, versatility and customisation. Italian government incentives for solar panel installation confirmed again for 2011. Compared to 2010, tax rebates have doubled from 5 to 10 years for those who choose a more eco-sustainable home. Ensuring not only environmental improvement but also low expenses, solar energy has undergone remarkable development in recent years and solar panel production is destined for even further growth. 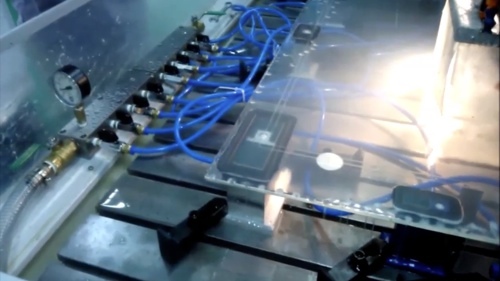 Have you ever thought about how each delicate solar cell is handled during the solar panel production process, where speed is very fast with relatively short cycle times? 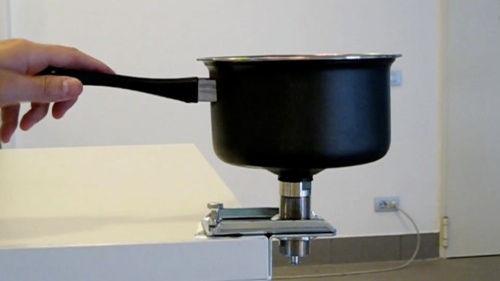 Vuototecnica has found the solution with BEC suction cups which make use of the Bernoulli theorem. 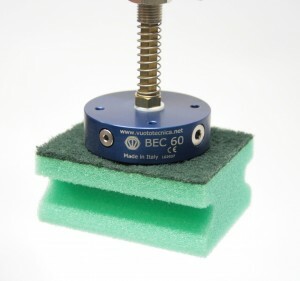 BEC suction cups have been specially designed to handle fragile objects such as solar cells, silicone discs, precious metal sheets and other objects that need to be handled with the utmost delicacy without any contact. Have a look here to discover all the characteristics of these suction cups and of other Vuototecnica patented vacuum gripping systems.